Enjoy 3 for 2 on Elemis. 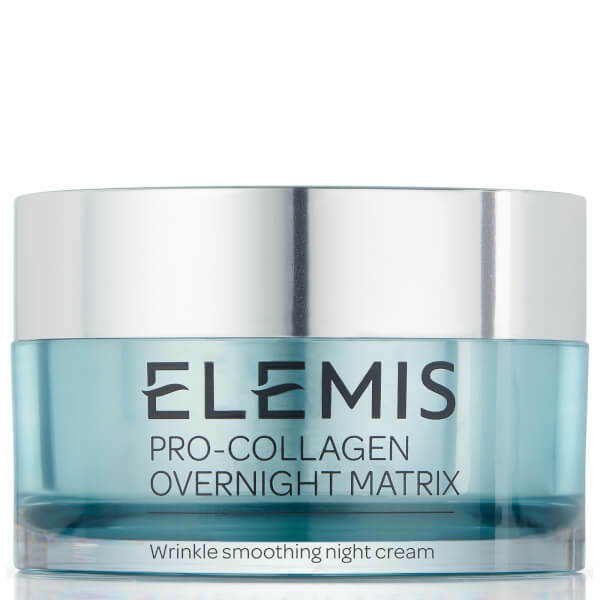 Wake up to hydrated, youthful-looking skin with the Elemis Pro-Collagen Overnight Matrix; an anti-ageing night cream that works to promote a smoother, more refined appearance. Fortified with Padina Pavonica (a unique Mediterranean algae) and revolutionary Smart Drone Technology that acts as a targeted delivery system, the lightweight formula delivers firming benefits for skin that bounces back to life. Absorbing quickly without greasy residue, the luxurious treatment helps to support the skin's barrier function and combat the damaging effects of stress, pollution and fatigue. 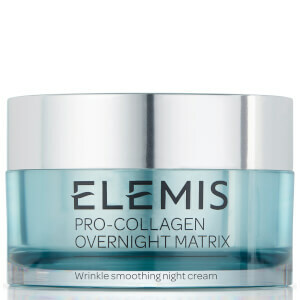 Minimises the appearance of fine lines and wrinkles, whilst replenishing and revitalising for a bright, healthy complexion come morning. To be used every evening, before bed. After cleansing and toning, warm a pea sized amount between the palms and gently glaze over the face, neck and décolleté. Always use upward stroking sweeping motions when applying moisturiser to the face. Avoid direct contact with eyes. Aqua/Water/Eau, Glycerin, Olus Oil/Vegetable Oil/Huile Végétale, Propanediol, Behenyl Alcohol, Squalane, Butylene Glycol, Octyldodecanol, Dicaprylyl Carbonate, Helianthus Annuus (Sunflower) Seed Oil, Phenoxyethanol, Acrylates/C10-30 Alkyl Acrylate Crosspolymer, Beheneth-25, Glyceryl Acrylate/Acrylic Acid Copolymer, Benzoic Acid, Lavandula Angustifolia (Lavender) Oil, Disodium EDTA, Dunaliella Salina Extract, Rhizobian Gum, Sodium Hyaluronate, Dehydroacetic Acid, Linalool, Lavandula Hybrida Oil, Pelargonium Graveolens Flower Oil, Padina Pavonica Thallus Extract, Geraniol, Eucalyptus Globulus Leaf Oil, Chlorphenesin, Plankton Extract, Anthemis Nobilis Flower Oil, Citronellol, Potassium Sorbate, Sodium Benzoate, Caramel, Cinnamomum Camphora (Camphor) Wood Oil, Limonene, Mentha Arvensis Leaf Oil, Tocopherol, Xanthan Gum, Caprylyl Glycol, Citrus Aurantium Dulcis (Orange) Oil, Fragrance (Parfum), Tephrosia Purpurea Seed Extract, Vitis Vinifera (Grape) Seed Oil, Menthol, Eugenia Caryophyllus (Clove) Leaf Oil, Sodium Hydroxide, Glyceryl Caprylate, Lactic Acid/Glycolic Acid Copolymer, Phenylpropanol, Palmitoyl Tetrapeptide-50, Polyvinyl Alcohol, Heptapeptide-15 Palmitate.